Back in the days when our stovetop grill was still clean, we decided to grill some eggplants indoors. 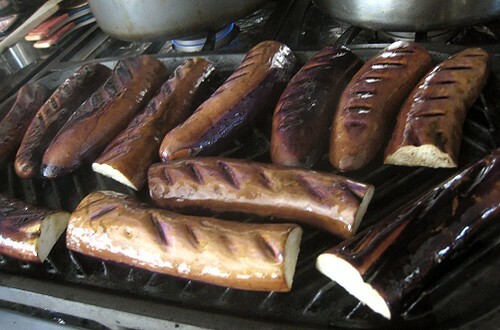 The eggplants were cut in half lengthwise, brushed them with oil, then proceeded to grill each side. Which reminds me, any tips on how to clean grills? Like, super-duper clean? Washing grates, stovetop grills also gets only 80% of the stuff that clings. Any ideas how to grill and grill implements to at least 90% of their original condition? It's quite disheartening to see the grill look not-so-new. Much as we love the taste of simply grilled eggplants, we thought we could add a Japanese twist to it by serving it with a miso dressing on top. We mixed together some red miso, a touch of sugar, some mirin and rice vinegar. This was heated for alittle bit. 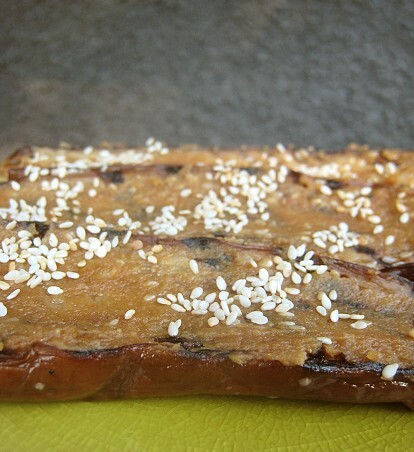 After the eggplant slices were done, we spread the miso mixture on top and sprinkled some sesame seeds to finish. This miso paste was also great on grilled portobello mushrooms and grilled zucchini. Remove caps from eggplants and cut in half lengthwise. 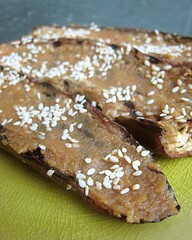 Brush eggplant slices well with oil. Grill/broil until browned on both sides, brushing with more oil if the eggplant looks dry. 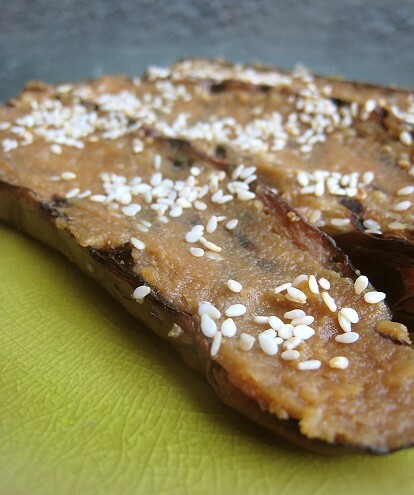 When the eggplant is almost done, combine, miso, sygar, mirin and rice vinegar in a small bowl. Cook for about 1 minute in a small saucepan, stirring. Spread miso mixture thinly over each eggplant half. Top with sesame seeds. Serve hot or room temperature. This is one of my favorite dishes! I'm patiently waiting for the eggplant in my garden to come in. As for cleaning grates... probably your best bet is oven cleaner. One of my favourite too! A great way to enjoy aubergine! Grilled eggplant is my fave as well. That look delicious. As far as cleaning the grill, try to clean while it is still warm. Seconding Caroline on cleaning the grill while it's warm. The sweet miso paste/sauce was really versatile, too. I think it will go with any grilled vegetables.